In a month from now the 16 Days of Activism against Gender Based Violence Campaign will take centre stage globally to highlight the violations that undermine the human rights of individuals in a culture of impunity which sets perpetrators free. It is well known that women experience acts of violence frequently be it on the streets, at home or in the workplace and despite such setbacks women carry on with their lives defending their rights. This is why we invite you to speak up in some form for the rights of women through the Sri Lanka 16 day’s campaign which begins in November 2015. In Sri Lanka, during the 16 days of activism members of the GBV Forum will raise awareness and introduce mechanisms to solve issues related to gender-based violence in the country while keeping with the global theme for 2015. 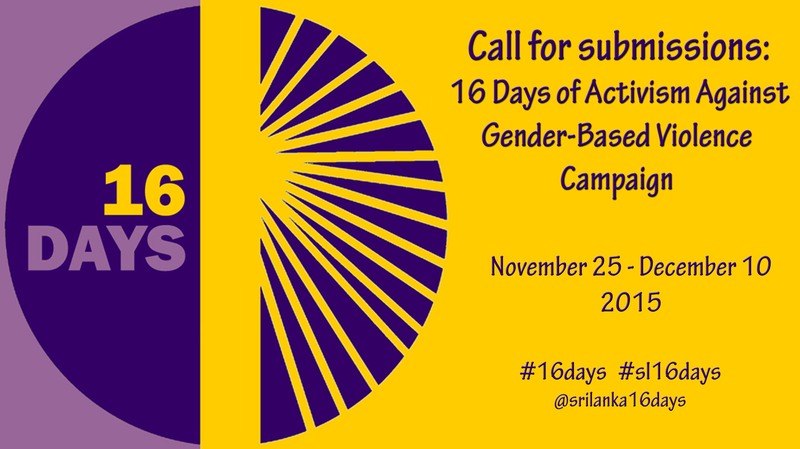 Women and Media Collective, a member of the forum, calls for your contributions for this year’s Sri Lanka 16 days campaign. Send us your thoughts, experiences or anything which is related to addressing GBV. These could be your creative works of art, writing, photography, essays, short films, interviews, cartoons, documentaries, and podcasts etc. that would raise awareness and open a discussion on Gender Based Violence. Your contributions in Sinhalese, Tamil or English are welcome. Once accepted your contributions will be published on the Sri Lanka 16 day’s blog and shared widely through our forum member channels online. You have the choice of posting your articles, illustrations or videos on your own web, blog, Twitter or Facebook site with the tag #16days and #sl16days or if you don’t have your own site you can send it directly to us and we will post it for you. Either way E-mail us your contribution on wmcsrilanka@gmail.com with the subject, Sri Lanka 16 days campaign. Each year the 16 days campaign against Gender Based Violence begins from the 25th of November marking the International day for the elimination of Violence against Women to the 10th of December, Human Rights Day.